A couple of day ago, I stumbled on GNU Radio. I was looking around electrokit online shop searching for components and I saw a Cyclone III FPGA Starter Kit for 1599 SEK (2000 SEK including taxes) and I thought : “uhmm, I could put one of this to some use” I was thinking that maybe there was a way to implement ZibBee radio using one of these FPGAs. So I started searching google about FPGAs and radio and I found GNU Radio. GNU Radio is a really good idea. You can get a really good explanation about GNU Radio in the GNU Radio site. 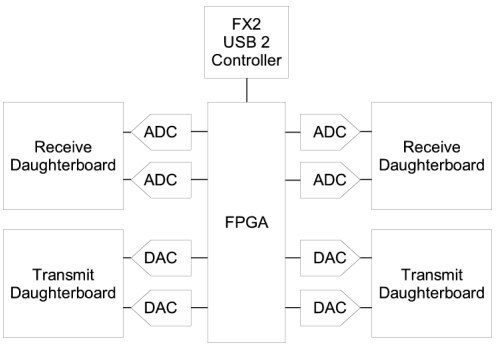 But the quick explanation is that you to signal processing in the PC by using something called an USRP that is a board that has an USB interface towards the PC, a FPGA and ADC, then you connect some RF frontend(s) (daughterboards) to the USRP. The RF frontend tunes the signal and puts in baseband, the ADC digitizes the signal and the FPGA runs a DDC (Digital down converter) and sends the samples to the PC via the USB controller. If you want to know more about the USRP, I recommend reading USRP Hardware and Software description. The only bad thing is the USRP hardware and the daughterboards are way too expensive for me (700 $USD for the USRP and 100 $USD for the TVRX daughterboards). So I’m back at looking at the Cyclone III FPGA starter kit, it seems that there are extension boards for it (HSMC daughterboards). So now I’m thinking about using one of those HSMC that provides ADCs to connect an RF Tuner and do something similar as GNU Radio but on a budget.